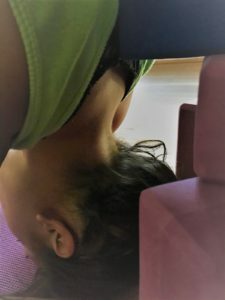 During a visit to an osteopath in Munich, I was told that most of the patients coming to the office with neck issues are yoga practitioners. That was a shock!…and even more shocking was that I was one of them! For this reason I will show you based on some asanas, how you can practice yoga safely. More posts will follow covering various topics. A block supports the thoracic spine. This prevents rounding the upper back and a good posture is guaranteed. In this way there is no stress on the neck. With block supporting the thoracic spine the neck takes its natural curve. You can see a dent at the base of the skull. 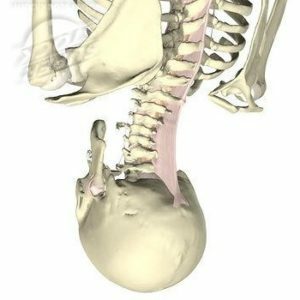 This shows that the nuchal ligament is soft and not stressed. Here the cervical spine / neck is in its natural lordosis. When the head moves forward and the neck goes into flexion, the nuchal ligament can be felt with your fingers. 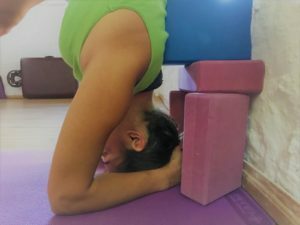 In headstand you want to keep a natural curve. When shoulders are raised, the nuchal ligament can 'stay neutral'. Too much forward flexion in the neck can stress the connective tissue around the nuchal ligament. The student here could have had more height under her shoulders in order to position even more on the tops of her shoulders. 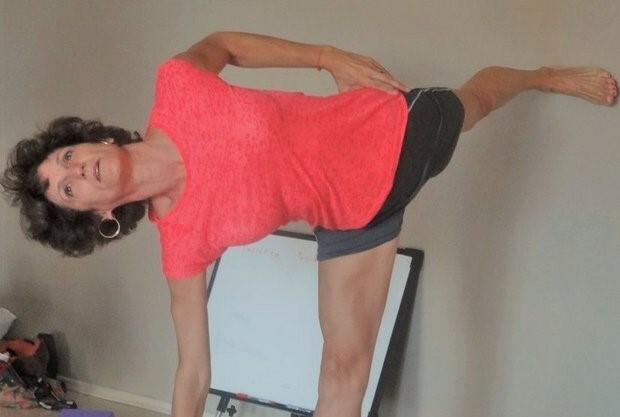 We try to find our personal and natural posture in an asana, and there are helpful instructions to achieve this: ‘lift the sternum and drop the sitting bones’ or ‘move the chin away from your chest’, are just a couple of examples. But carrying a healthy and upright posture into our daily life will bring about an attitude change. We then feel strong, balanced and happy. In many asanas we move the chin away from the chest. This helps to keep a good posture and frees your neck. 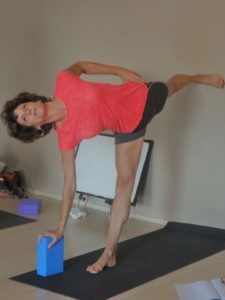 In this ardha chandrasana variation a student held a block to the crown of my head. I pushed into it whilst moving my chin slightly away from my chest. 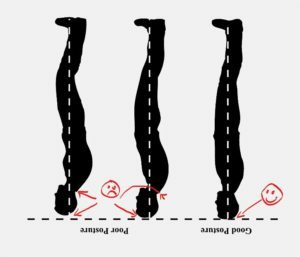 This has a similar impact to the posture as in headstand. 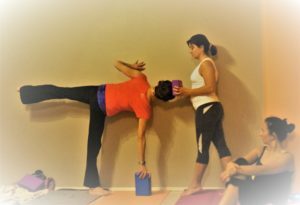 Knowledge about physiology is helpful and a must for a yoga instructor. However it doesn’t replace self-practice and learning to sense what feels good and what does not.